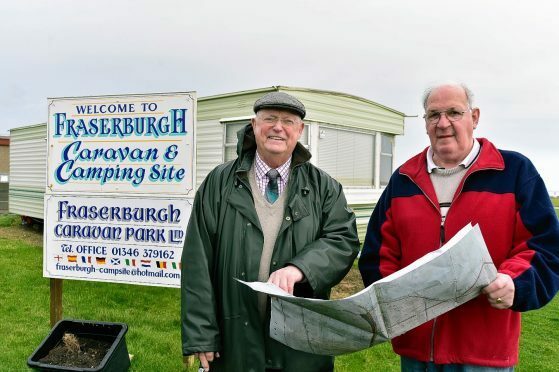 The directors of a north-east caravan park which has remained unchanged for 40 years say the site is in desperate need of an upgrade to boost tourism to the area. Fraserburgh Caravan Park overlooks the town’s renowned golden beach and has long been popular with visits to the area during the summer months. But despite the lure of local attractions the accommodation itself – which has 28 stances with electricity hook-ups and another 15 without – is now outdated. Now the managers of the park have lodged a planning application to change the situation. Last night park director Jim Clark said: “Fraserburgh needs a good modern caravan site – the present facilities are believed to be unchanged since the 1970s – to encourage more people not only to come to the town but to have them stay for longer periods. Mr Clark said the “ambitious” plans include upgrades to the park grounds, the toilet and laundry facilities and an upgrade to the wi-fi system. The team wants to create a reception and family area and an office for staff. Mr Clark and his colleagues are currently in talks with Aberdeenshire Council planners about the application and are investigating grant schemes to fund the development. Local councillor Ian Tait has been closely involved in the development. Last night he said he been in contacted the council’s economic development team to get a long-term lease secured for the site. He added that the upgrades would boost an “exceptional asset” for the town and help revitalised the beach.